The Village Center for the Arts in New Milford will present a ”Wheel with Friends” pottery class for adults, March 9 and 16 at 7 p.m. Above, past participants proudly show their pottery pieces. 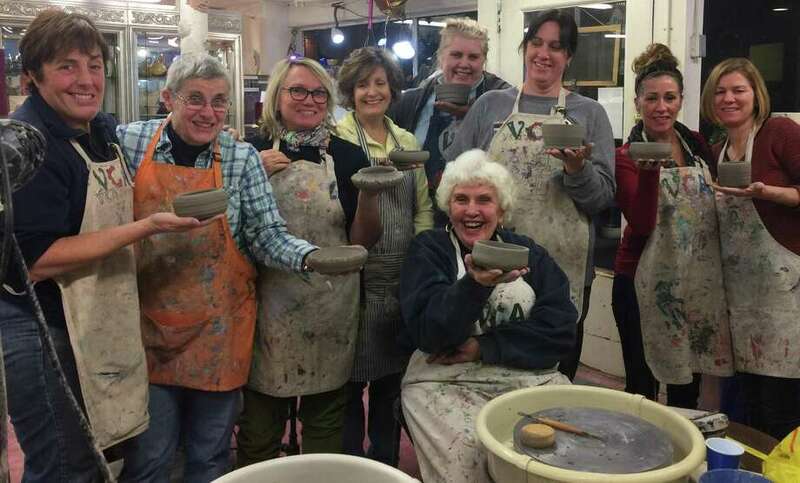 The Village Center for the Arts (www.villagecenterarts.org) in New Milford will offer “Wheel with Friends,” a pottery class for adults, March 9 and 16 at 7 p.m.
Sharon Kaufman will guide students through the steps of creating pottery on a pottery wheel at the Main Street art studio. Students will throw (make the piece on a pottery wheel) on the first night and trim/foot the piece on the second night. The third step, glazing (painting), will be done at the student’s leisure in open studio with instruction at VCA. Participants are encouraged to bring nut-free food and drinks to share for all. All instruction, supplies and firing are included in the $110 fee per person. For information and RSVP, call VCA at 860-354-4318 or register online.